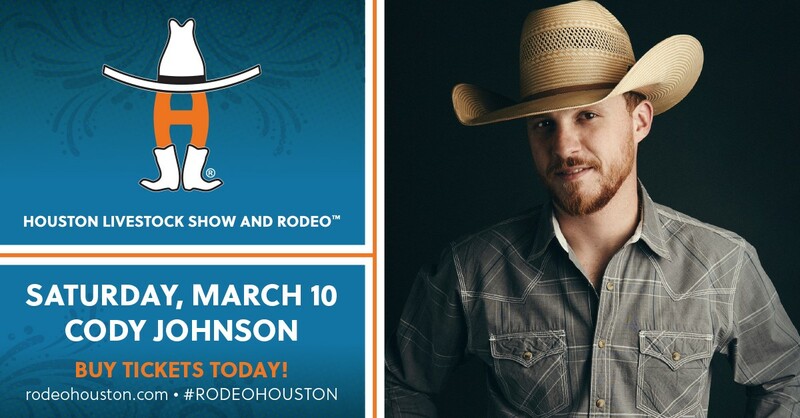 Get Your Cody Johnson RodeoHouston Tickets TODAY! RodeoHouston tickets are on sale TODAY! While tickets go on sale at 10 a.m, Show officials said the online waiting room will open at 9:30 a.m. Thursday. Customers who entered the "waiting room" between 9:30 a.m. and 9:59 a.m. are randomly selected to enter the "store." Those entering after 10 a.m. are placed behind those already in the "waiting room." Each entertainment performance is purchased as a separate order, rodeo officials said. To purchase another performance, the customer will have to return to the Waiting Room. Get your Cody Johnson tickets here. Rodeo ticket prices range from $18 to $25, plus a $4 per ticket convenience fee. A few performances may have a limited number of tickets, including scattered singles (no two seats together), available from $30 to $100. A 6-ticket purchase limit is set for the Feb. 28 – March 17 performances. All tickets will be delivered via Flash Seats. Customers should allow 48 hours for delivery. For more information on Flash Seats click here. Individual rodeo tickets may also be purchased through the AXS mobile app on Android and Apple devices. They can also be purchased in person beginning Friday at the NRG Park box office with no service charge.